(CNSNews.com) - Rep. Bob Goodlatte (R-Va.), the chairman of the House Judiciary Committee, told Fox News on Sunday he expects former FBI Director James Comey to appear before his committee later this week. Comey has decided not to fight the committee's subpoena to appear in a closed-door session, where lawmakers can ask him questions that Comey might not be able to answer in a public setting. In a tweet on Sunday, Comey wrote: "Hard to protect my rights without being in contempt, which I don’t believe in. So will sit in the dark, but Republicans agree I’m free to talk when done and transcript released in 24 hours. This is the closest I can get to public testimony." Goodlatte said lawyers for Comey and the Judiciary Committee "have been working cooperatively," and he predicted that Comey would drop his effort to quash the subpoena -- which Comey did do later on Sunday. 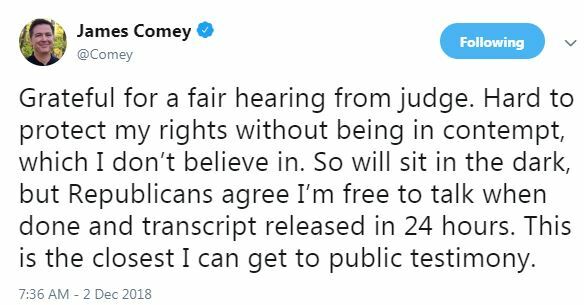 Comey has agreed to sit for a closed-door session that will be transcribed, redacted in parts if necessary, and then released to the public. Goodlatte said a private setting allows fuller questioning of the witness, as opposed to five minutes for each committee member in a public setting. We have now examined thousands of pages of documents, searched through nearly a million documents, interviewed 16 other witnesses. Mr. Comey is, as the former FBI director, at the center of both of these investigations launched in 2016 with regard to Hillary Clinton and the Trump campaign. And it's the culmination of that. We have been asking for Mr. Comey to appear for a few months now. And when he refused to appear voluntarily for a transcribed interview, I was forced to issue a subpoena, which he now has sought to quash. That's, in my opinion, inappropriate. And now it's time for us to conduct that interview. After that interview, we do need to wrap up. But I will also say that there are always more questions that people will have. And that's why I'm pleased that Senator Lindsey Graham, who is expected to be the next chairman of the Senate Judiciary Committee, and Chairman Ron Johnson of the Senate Oversight Committee, have both expressed very strong insurance interest and intentions to me to continue to pursue this matter. So, we do need to wrap it up. We do need to get this information out to the public. And we are hard at work on doing that. But Mr. Comey's testimony is a critical part of that. "And what are you going to find out from Jim Comey?" Bartiromo asked. "What are the most important questions you need to ask him?" But you can -- you can imagine that you have a 400-page inspector general's report. You have the testimony of 16 other witnesses, all of which were taken in private transcribed the interviews. You have the thousands of pages of documents. Those have generated literally hundreds of questions that need to be asked. And we are prepared now, with some very experienced former prosecutors, like Trey Gowdy and John Ratcliffe, and very experienced investigative staff, to ask those questions and get to the bottom of this answer. We want to follow this matter. We want to follow the truth where it leads. And then we want to make these transcripts available to the public, so that they can draw their own conclusions about what occurred in 2016. I'm concerned. And it's my hope that, by doing this, we will prevent it from happening again in 2020, or hopefully ever again. The FBI was -- was misused in 2016. And this is an organization that is very, very important. Every day, thousands and thousands of great FBI agents and others protect us from terrorist attacks, prevent crime, solve crimes. This organization has been hit hard, and they need to be rehabilitated. Goodlatte added that every American should be concerned about some of the actions taken by Comey when he was FBI director, including his decision to announce the reopening of the Hillary Clinton email investigation just days before the 2016 election. "And every American shouldn't want the FBI being weaponized, as some have claimed, by the Democratic Party, when they created the situation in which a dossier was then used by the FBI to get a warrant from the FISA court," Goodlatte said. "These are all things that should concern every American in terms of protecting their civil liberties and making sure that their elections are free and fair."